Musicians: Raymond Pounds (drums on 1), Greg Phillinganes (keyboards & synthesizers on 1,2,4,5,6, & 7, instrumental arrangement on 1,marching snares on 9), Steve Forman (percussion on 1,2,6, & 7), Tommy Funderburk (background vocals), Arnold McCuller (background vocals), Lauren Wood (background vocals on 1-7), Arno Lucas (background vocals on 1 & 7), Gary Mallaber (drums on 2-6), Gary Ferguson (drums on 2,4 & 8, marching snares on 9), Kenny Lewis (bass on 2,4,5,6 & 9), Marty Walsh (guitar on 2,5,6,7 & 9), Tom Kelly (background vocals on 2), Allee Willis (background vocals on 2,8 & 9), Lani Hall (lead vocals, background vocals on 8 & 9), Herb Alpert (lead vocal on 3, flugelhorn solo on 3), Mike Baird (drums on 3), John Pierce (bass on 3), Jeremy Lubbock (grand piano on 3, instrumental arrangement on 3,7 & 9, string arrangement on 6, fender rhodes on 7, keyboards on 8), Randy Waldman (fender rhodes on 3), Gerald Vinci (concertmaster on 3,5,6,8 & 9), Jules Chaikin (string contractor on 3,5,6,7,8 & 9), Jon Lind (background vocals on 3-6), Marcy Levy (background vocals on 3-9), Jay Graydon (guitar on 4), John Jarvis (fender rhodes on 4), Steve Varneau (harmonica on 4), Jerry Hey (horns and horn arrangement on 6), Charlie Daniels (horn on 6), Bill Reichenbach (horn on 6), Kim Hutchcroft (horn on 6), Jeff Porcaro (drums on 7), Mike Porcaro (bass on 7), Glenn Dictarow (concertmaster on 7), Harvey Mason (drums on 8), David Hungate (bass on 8), Michael Boddiker (synthesizer on 8 & 9), David Lasley (background vocals on 8 & 9), Sharon Redd (background vocals on 8 & 9), Tim May (guitar on 9), Bruce Roberts (keyboards on 9), Brian Mann (keyboards on 9), Paulinho Da Costa (percussion on 9), Victor Feldman (vibes on 9). 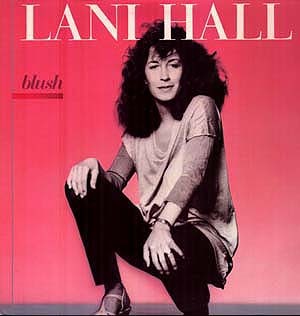 Lani’s fifth solo album, Blush, finds her being produced by Allee Willis. She was the lyrics composer on the title track to the last album, and did the lyrics for all songs on this album. Allee Willis would also go on to fame and fortune as co-writer of the theme song to the TV show “Friends,” the Rembrandts’ “I’ll Be There For You.” While disco flavors into several cuts on the album, there are ample ballads here as well. In fact, the quintessential Lani & Herb duet, “Come What May” debuts here. It would appear in different forms several more times on later albums, but this is the song at its best. A power ballad that is a favorite among Lani’s fans, the song builds to a harmony crescendo in the middle, and calms back down to a fade with Herb Alpert’s beautiful flugelhorn solo trailing out.